MaXhosa by Laduma is a range of knitwear created by Laduma Ngxokolo who completed his BTech at the NMMU in 2010. The NMMU assisted Laduma to manufacture his knitwear and start his business. He won a number of awards at local and international design exhibitions, and his knitwear is currently sold in Cape Town and London as well as being used in various local advertisements. Laduma’s vision is to create sustainable jobs and attract investment to the Eastern Cape and South Africa. Manufacturing: There are no small-scale toll production knitting manufacturers in South Africa that have a suitable knitting machine. The only company that could assist has recently gone into liquidation. Raw materials: The initial work was done on mohair, but getting a good source of suitable mohair is a challenge even in the Eastern Cape where it is produced. Wool is available, but usually has to be bought in one ton quantities, which is not feasible for a small business. Investment: Private investors want Laduma to manufacture in China or Mauritius due to high labour costs in South Africa. Government funding agencies only pay after costs have been incurred, which is difficult for a cash-strapped small business. 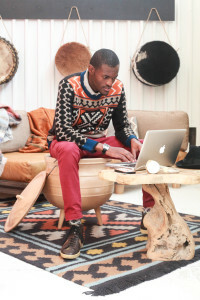 Laduma Ngxokolo is a visionary designer and an excellent spokesperson for both his brand and the NMMU. Current funding opportunities are limited and, although the NMMU has provided some assistance, Shugaz requires investment of R600 000 for a suitable knitting machine in order to move forward and grow.